"Life" by Louis Andriessen with video by Marijke van Warmerdam is going to receive its world premiere by Bang on a Can All-Stars ensemble for which it was written on March 22 in Milan. Andriessen explained in program note “(...) We decided to make a kind of contemporary “Pictures at an Exhibition”: short pieces of music to accompany video clips. This resulted in Life -- four short compositions which combines late romantic ‘European’ music with hip ‘American’ repetitive music. This combination is stretched by the use of cross-references, parallel with what happens in the four films: every film is completely independent, but contains allusions to the others”. In recent conversation Andriessen evokes his latest collaboration with Marijke van Warmerdam. Jelena Novak: You mentioned that “Life” is like contemporary “Pictures at an Exibition”? Louis Andriessen: Marijke found it difficult to think in time. A lot of visual artists don’t know how to handle the fact that things have duration. I said “I can understand it very well so why don’t you forget about time and I will take care of the time”. I think that at earlier times we also talked about narrativeness in art, that is something that interests me very much in the last ten years, specifically because of the vocal music I write. That is the situation with the famous Mussorgsky piece. Of course it is about paintings but the paintings seem to make you think of a story. And that is very interesting in between time and static situation of the visual arts. Four films are quite different and there are cross references through the films. It is more or less the same which I did in the music too. There are memories from earlier pieces in later pieces, but the four pieces are quite different, like a movies. JN: Did Marijke first made videos or you worked in parallel? LA: We talked about it a lot and then she had a sort of synopsis of the four movies and she had even no idea which order she would like them. I think she was earlier than I was, starting to shoot things. I remember taking my car to the forest where she made the second one. She used crane because there is an old couple on the bench sitting and looking over the little lake. You see them from the back, than you go up, like an angel, and then you go down again, and the camera moves under the bench, turns around and comes out of the bench, then you see the couple in front and then the camera goes very high up like you are an angel again, turns around in the air to arrive at the opening position. It makes a large circle. For moving under the bench she needed some hi-tech computer animation, because it is totally impossible, it is quite amazing. JN: You have wall painting done by Marijke van Warmerdam. I remember seeing it on the postcard. 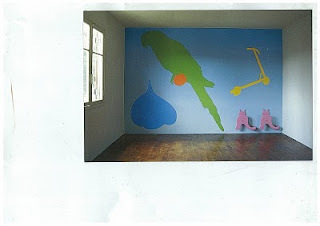 LA: It was a present from my friends for my sixtieth birthday, to paint one of the walls in house in France. It is called “Wall of preferred things”. She had the list of my preferred this and that, and made a choice of four of them, which was: favorite pet – two cats, favorite vegetable was garlic, favorite transport medium was a little step bicycle that children use, and favorite animals were birds – a large parrot. Few days ago when I had dinner with her we had a discussion because I said I call the picture fresco, than we looked in Wikipedia and other places when you can call wall painting a fresco. During our absence the neighbors found out that the part of the ceiling was broken and fell on my desk and on the piano. After a while they found on the floor, in a bin, a dead rat! The rat made a sort of jump from the roof and ceiling and fell down. While repairing that, they have hurt the fresco and Marijke is coming with me in late April to the house to repaint it. Now the part is painted white and it is really like the fresco because all these beautiful Giotto’s and stuff in Italy are also partly completely white. JN: Would you like to discover some of the musical references you use in “Life”? They are not quotations. They are what I call allusions. I start with late French romantic melody for the soprano sax. So, Evan Ziporyn does not play on his clarinets and bas clarinets (in the last part he plays clarinet, but he changes it into soprano sax). This melody is sort of remembered during the second and third movement but most of the first and second movements are sort of American repetitive musics. In the second part it starts to become what I call more human. That means that there are harmonic changes and melodies that have to do with French late romanticism. It is basically about those two things, except for the third film in which you only see window blinds, and from time to time hand moves over them to change a little bit a position. That whole part is an imitation by the group of sort of the sound that you could imagine that would be heavy metal material. It’s kind of really live sound but it’s very evident that it’s not synchro at all. It is a kind of musical interpretation of what you see. That works very well. In that part there is no connection with the other three. Of course there is in the film. I don’t follow the cross references at all because the last film starts at the window of nineteenth century country house or so. It has been hot inside, so there is steam on the window, you can’t see through. At the certain moment when the camera zooms in, than you see a hand again to clean the window, and then you can see outside, than it takes some time to focus on what you could see in the far away, you see the same old couple sitting and watching over the lake. So there is allusion on film number two. Somewhere there I start again with the melody we have heard in the first part. Sounds all very classical, but I find it rather good I must say. The combination with the film is quite interesting. JN: And the very title “Life”? LA: That was the long discussion with Marijke. We have talked about Steam, because of the steam in the last film. Then she came up with Life which I didn’t like, and said that I will change one letter and make it Live – I think of it as something that you should play live with, like we did before, the first collaboration we did was on version of "Passegiata". But she didn’t like that at all, and so it became Life. JN: Life is a kind of very important word, it’s not a kind of allegory of life? Marijke thinks that it is the main subject of the movies. I said - my dear, than every movie should have that title. As far as I know, except for the American magazine, it is not very much used title at all. Then I said ok, let’ do it. JN: Musically it is your further exploration of ‘lukewarm waters of romanticism’, as you once said. LA: “Anaïs Nin” is a kind of final step. I can’t go much further from what I did in "Anaïs Nin". Probably I have to move forward now towards new directions.